Kate Middleton is walking down the aisle of Westminster Abbey as I type. All celebrities, dignitaries, royals, friends and family are seated. We watched Prince William and Prince Harry arrive together earlier after a short drive from Clarence House. Kate left the Goring Hotel with her father and arrived at Westminster Abbey shortly after. Both Prince William and Kate were waving to the crowds and look relaxed. 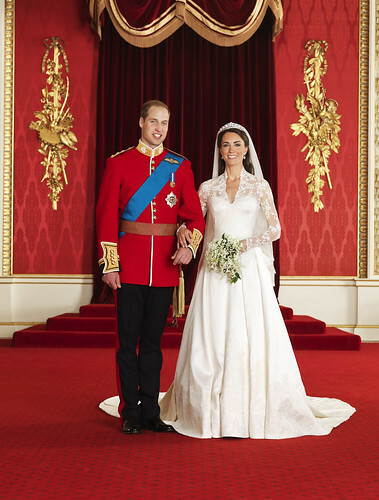 Prince William was dressed very much as a military royal and Kate looked fantastic, wearing her hair down with a tiara believed to be a royal heirloom. Posh and Becks arrived earlier with Becks smiling and looking relaxed whilst in typical fashion Posh was pouting to the point of looking like her jaw had been wired shut. The Queen did not disappoint, looking as wonderful as she always does....and the hat...was yellow after all!